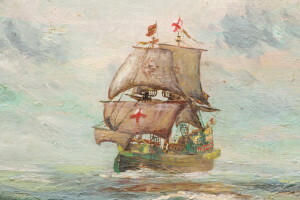 “The Golden Hinde”, 20 x 25 cm (8″ x 10″), oils on board, by Gordon Frickers. 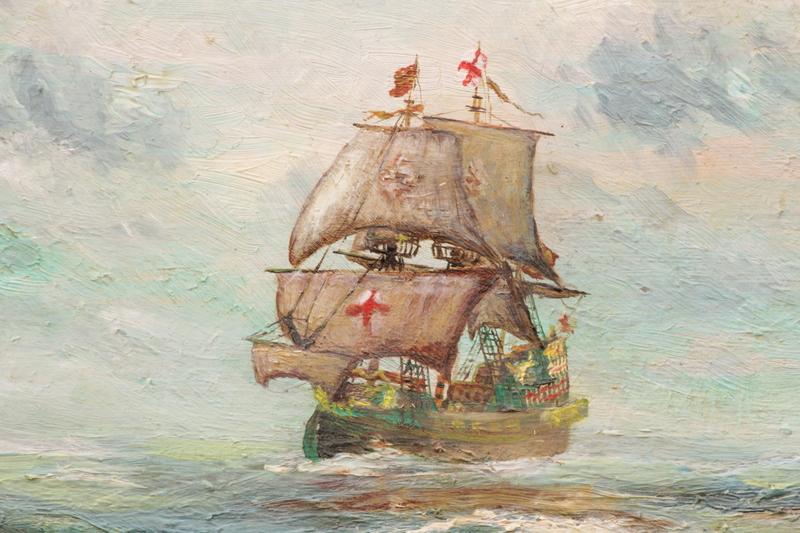 Francis Drake’s courageous voyage between 1577 and 1580 made his reputation, many discoveries and a fortune. To commission a similar painting available, excellent value, can be acquired by payments in 4 easy stages, this one was priced at £650 in 2009. The Golden Hinde voyage remains one of the most extraordinary adventures of all time combining many of the ingredients of a bestselling story. Francis Drake was a Devon man who captained the “ Golden Hinde ” (pronounced – ‘hiynd’) (or Golden Hind), an English “Race Galleon” type of ship Sailing out of Plymouth, England Drake became the first Captain and the First English captain to circumnavigation the globe. Ironically, this painting, on one of the very, very rare occasions I’ve allowed art work to leave my studio unpaid for, was taken to Amsterdam by a Dutch woman Maryse Sportouch, and never paid for; an act of piracy if ever there was one!